g(x) = ax2 + bx + c, where a and c are negative constants. c is the intercept at the y-axis and it is negative. This means the graph must cross the y-axis at a negative value. 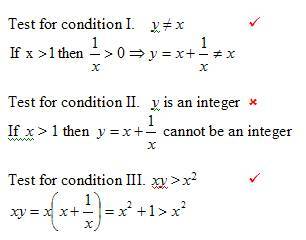 From the given graphs, only (A) satisfies that condition. Let the line PQR cross the rectangle at S and T.
Let the length of SQ be x, then the length of QT would be 4 – x. Being consecutive even numbers we need to add 2 to the previous number. The sides of the triangle would then be x, x + 2 and x + 4. Using the Pythagorean formula, we get the equation.